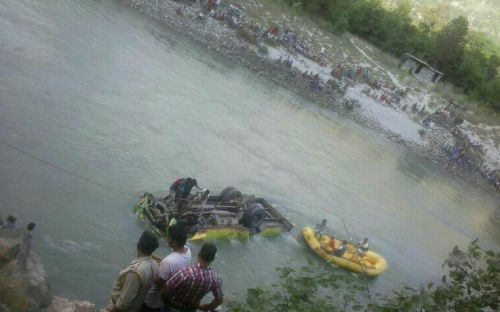 As many as 32 persons were feared dead, when an overcrowded private bus plunged into Beas River on Kullu-Mandi national highway. 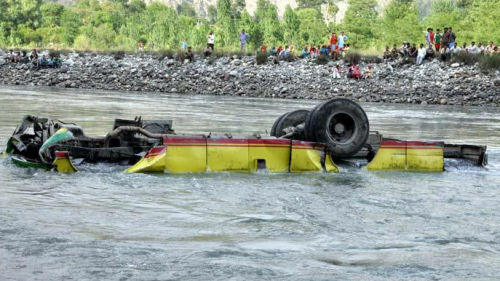 The bus was on its way to Ani from Kullu when it skidded off road and rolled down into the river near Jhiri, 20 km from Kullu. As per the initial reports from Govt agency, there were around 45 to 50 passengers travelling in the bus, however, eyewitness claiming that more then 60 persons were in the bus. Deputy Commissioner, Kullu, Sharab Negi said that twelve bodies have been recovered while 15 persons were rescued and rushed to hospital. It’s feared that more than two dozen persons are feared trapped in the submerged bus. The cause of the accident is not known yet, but driver of the bus had jumped off the vehicle before it plunged into the river. The ill fated bus toppled upside down after the accident, completely submerged under water and only the tyres were visible. Most of bodies are feared to be trapped inside the bus. Relief and rescue teams have reached the spot and efforts are being made to recover the bodies and pull the bus out of the river. Governor Urmila Singh and Chief Minister Virbhadra have expressed grief over the accident and conveyed their heartfelt condolences to the bereaved family members. Chief Minister directed the district administration to provide all possible assistance to the victims and the kin of those who died in the mishap. He directed to carry out relief and rescue operations on war footing. SP Mandi R.S. 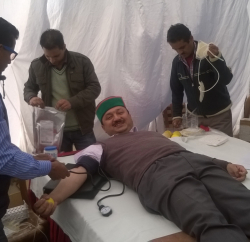 Negi and ADM Mandi Pankaj Rai rushed to the spot to monitor relief and rescue operations. Meanwhile, district administration has announced Rs. 15,000 each as immediate relief to the kin of deceased and Rs. 5000 to the injured. Brij Bihari Lal Butail, Speaker, H.P. 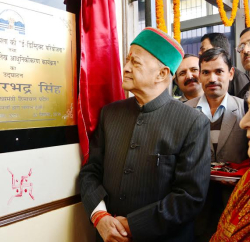 Vidhan Sabha, Prem Kumar Dhumal, leader of opposition, Vidya Stokes, Irrigation and Public Health Minister, Kaul Singh Thakur, Health and Family Welfare Minister, G.S. Bali, Transport Minister, Sujan Singh Pathania, MPP and Power Minister, Thakur Singh Bharmouri, Forest Minister, Mukesh Agnihotri, Industries Minister, Sudhir Sharma, Urban Development Minister, Prakash Chaudhary, Excise and Taxation Minister, Dhani Ram Shandil, Social Justice and Empowerment Minister, Anil Sharma, Rural Development Minister, Jagat Singh Negi, Deputy Speaker, H.P. Vidhan Sabha, Rajesh Dharmani, Vinay Kumar and Neeraj Bharati, Chief Parliamentary Secretaries, Karan Singh, Balbir Singh Verma MLA have also expressed grief over the bus accident. Edited: Death toll has rose to 38 now. सड़क दुर्घटनाओं के लिए राजनीति सबसे बड़ी दोषी है और नेता सबसे बड़ा हत्यारा, हिमाचल की जनता को अपनी जान बचाने के लिउ एचआरटीसी के इस कुप्रबंधन के खिलाफ एकजुट होना होगा अन्यथा हम अपनी जान यूही गंवाते रहेंगे। नेताओं और अफसरों को कोई फर्क नहीं पड़ता क्योंकि ये बसों में सफर नहीं करते..